Louise Campbell is an experimental Danish furniture and lighting designer. She attended the London College of Furniture and Denmark Design School, after which she opened a workshop. 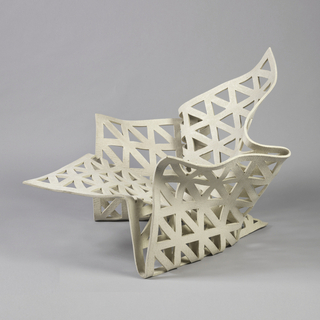 Campbell creates playful designs, such as “Bless You” Chair (1999) made of felt and stiffened with gelatin in the form of a crumpled perforated handkerchief, and the “Crown Prince” Chair (2001). In 2005 she was awarded Danish Designer of the Year. We have one object that Louise Campbell has been involved with.